OptiMA Moving to New Headquarters, Will Triple Manufacturing Space. 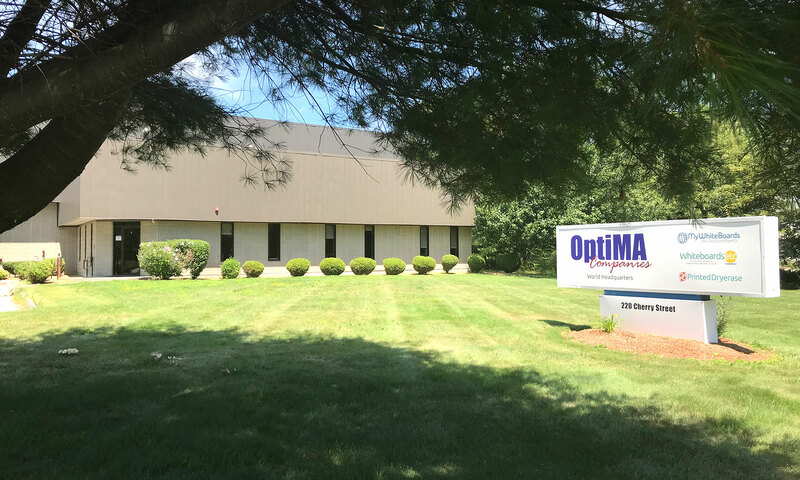 Shrewsbury, MA – As spring begins so to does OptiMA’s plans to move to a new facility in the Hills Farm Industrial Park. Work is underway as OptiMA builds out its new 34,000 square foot headquarters and manufacturing facility. While the move is within the same park less than 300 yards away, the new location will nearly triple the manufacturing space for its growing whiteboard business. With the move OptiMA hopes to keep up with the growing demand for its products while upholding its mission of continuous improvement through lean training and principles. OptiMA’s goal is to increase production, reduce lead-times and be up and running in the new facility prior to the busy school buying season. OptiMA manufactures several lines of whiteboards, custom dry erase boards and accessories including GreatWhite™ whiteboards, MagTray™ Marker Trays and Opti-Print™ custom printed dry erase boards to name a few. These products and more are sold direct to consumers on OptiMA’s e-commerce websites, MyWhiteBoards.com, WhiteBoardsEtc.com, MyVisualDisplay.com and PrintedDryErase.com. OptiMA Inc is a woman owned small business in operation since 1987.